I understand that there has and always have been various questions in regards to lighting and I've found a few people have been misled as to how some lamps work and what their best used for. I've decided to write an article to help people understand the aspects of lighting, and help them make a decision as to what lamp they'd like to use in their aquarium, home or office. Lamps fall into two broad categories, incandescent and discharge. There is another category of lamp, light emitting diode of which is more and more common these days, but at the moment isn't as efficient as discharge lamps. The discharge lamps can produce light directly or indirectly. This is done via a former passing a current through a gas or a mixture of several gases and vapours of which causes ionisation which in turn gives off light. In the indirect type, the ionised gas is used to excite a phosphor coasting on the inside surface of the glass envelope(your common fluorescent tube). Once again several lamps are of value in todays industry. Incandescent lamps produce light over the full range of visible spectrum. The word incandescent implies that a material is brought to such a high temperature that it glows, giving off light. If the glowing material is in the presence of oxygen, it will very quickly oxidise or in lamens turns burn up, therefore it is important to exclude oxygen if the glowing material is to be used as a source of light. All gas discharge lamps are pressurised and will require some way of boosting the mains power supply either temporarily or permanently in order to ignite the gas. This function may be provided by an inductive device such as a ballast or transformer(a ballast is also referred to as a choke in some countries). When a normally stable atom loses or gains electrons, the natural balance between the number or protons and electrons is upset. The atom now has a net charge which is either positive or negative. Such an atom is called an ion. The process of creating ions is called ionisation. When exposed to an external porential difference, these ions become charge carriers and take part in current flow. Once ionisation has commenced additional electrons and ions are produced as a result of the bombardment of flowing charge carriers which in turn releases even more electrons leading to more ionisation. This process very quickly snowballs resulting in a very high current flow. It is for this reason that all forms of discharge lighting require current limiting. The starting device whether it be a ballast or transformer will also be designed to provide the necessary degree of current control. Whenever an inductive device such as a ballast or transformer is used in a lighting circuit, voltage and current in that circuitare no longer in phase with each other. Wattless current in the circuit needs to be corrected by fitting a suitable capacitor across the mains supply of the lamp. This lamp has two envelopes. The inner bulb made of quartz (which operates at a temp of about 500 degrees celcius) contains a small quantity of mercury and argon. Argon is used to initiate the discharge. Once initiated the main discharge takes place through the mercury as it vaporises. Metal halide lamps are similar in design to mercury vapour lamps. The major difference is that the metal halides are used in addition to mercury inside the arc tube. Once the lamp attains full operating temperature, the metal halides partially vaporise. The metal halide lamps also differs from the mercury vapour in that is requires a higher starting voltage than that of the mains supply to commence ionisation. The ignitor used in these circuits is basically a larger starter of that used in fluoro fittings. Colour rendering properties of halide lamps are also superior to those of the phosphor coated mercury vapour, but phosphors are also applied to outer envelopes of meral halide lamps, to lower their colour temperature, These lamps exhibit some colour variation from lamp to lamp due to age and the quality of the envelope used. This consists of a long glass tube which has its internal surface coated with a fluorescent power. The tube contains a small amount of argon and mercury. At each end of the tube is a tungsten coil filament coated with barium and strontium carbonates, These carbonates convert the predominantly ultra-violet light ouput to a suitable colour light in the visible range. When the switch on fitting is closed, the supply voltage of 240VAC appears across the starter via the filaments in the tube. The gas in the starter ionises and the heat generated causes the bimetallic strip in the starter to bend and touch one another forming a closed state. When the starter is closed supple current flows through the coated filaments releasing free electrons into the fluorescent tube. However, the closure of the starter contacts causes the voltage across them to fall to zero. This cools the gas in the starter and the bimetallic strips open. As the lamp warms up, the droplets of mercury are vaporised so that the pressure inside the inner bulb increases and the potential difference between the tungsten electrodes increase from approx 20v to about 140ish. this takes about 4 to 5 minutes. As the mercury vapourises the reddish colour of the argon is gradually replaced by the blue/green colour of the vaporising mercury. When fully vaporised the mercury vapour creates a pressure of about ten atmospheres in the inner bulb. A ballast limits the current through the mercury vapour to a safe limit. 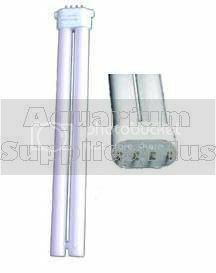 This type of sodium vapour lamp consists of a special corrosion resistant glass called plyglass 'U' Tube containing sodium together with a neon/argon gas mix at low pressure. Argon is introduced to reduce the ionisation voltage required. There are two coated electrodes inserted into each end of the 'U' tube which are then connected to an auto-transformer that has a no load voltage of approx 450v. This voltage is sufficient to initiate a discharge through the gas, which produces a reddish yellow colour. As the temperature in the 'U' tube increases, the sodium is vaporised and the colour of the light changes to a monochromatic yellow. The 'U' tube is enclosed by an evacuated outer glass envelope which acts much like an insulator to help maintain a temperature of approx 200 degrees celcius. To ensure the sodium solidifying sodium is evenly distributed in the 'U' tube when it cools, this lamp much be mounted horizontally. When the pressure inside a sodium lamp is increased, the spectrum of light emitted is broadened to include colours other than yellow. The inner discharge tube of this lamp is made from a sintered alloy oxide which is resistant to hot iodised sodium vapour. The pressurising gas is xenon and the metals used to create the ionising path are an amalgam of sodium and mercury. Both the low-pressure and high-pressure require a starting voltage of approx 2.5kv(2500v). If there is any other questions regarding lighting or electricity in general, i am happy to help via pm. I will not however explain how to wire something, and i feel strongly when i say you are far better off getting an electrician to install your lights or any other piece of electrical equipment, You may think you can wire something, and you may think you know how it works, and you may even think your good at it. but let me tell you; you have no idea of what your dealing with an the risk involved. i could care less for the survival of your fish in your tank, i do however care dearly for the lives of your children and family and the lives of any visitors you may have. Electricity is dangerous. Voltage does not kill you, Current does, and it takes less than .5 of an Amp to kill you. Your lights run off a maximum draw of 10Amps. It does not matter how small an appliance or light is, You will risk your life and the life of your family. - You Can NOT See it! - You Can NOT Touch it! - You Can NOT Hear it! - You Can NOT Smell it! Electricity does not exhibit feeling or sympathy for those who play with it, and if the potential to ground is great enough, your life or someone elses could very well be over. Thought this could be useful as a sticky. Be sure to let me know if there's any mistakes or suggestions, additions etc. When checking out tank hoods and light units it's often difficult to tell what's what if they're not clearly labelled (and sometimes incorrectly). T5NO/HE (Normal Output or High Efficiency) - seen in newer hoods. T5HO (High Output) - mainly seen in newer style light units and DIY kits. T8 - problably the most common in freshwater aquaria - seen in older style hoods and light units. T12VHO (Very High Output) - an older technology and rarely seen AFAIK. CF (Compact Fluoros) - seen in nano-style tanks and household power saving type bulbs etc. PCF (Power Compacts) - single ended style T5's often seen in Aqualina and JEBO light units. As noone has mentioned it yet, I might point out that the number after the T are eighths of an inch. It designates the width of the tube. T8 tubes are 8/8" or one inch in diameter. T5 are 5/8", T12 are 1 1/2" and so on right down to T2 at 2/8"
Just thought that might be useful to know. As a suggestion perhaps you could say which kind of light works best for a particular size tank. I have 2-3 tanks requiring lights. I want cheap or secondhand lights so I can see the fish. My 20 litre needs a light to check on fish health only. This is quarantine or fry tank with no substrate. My 40 litre acrilic tank. This needs light for me to see fish and have some plants grow. Also where you can buy these lights. I have a 40cm X 40 x 40 cube and want to grow plants. Does anybody know the the aqua one plantgrow andnis $95 a good price? can you also pse tell me a good spot to find amazon substrate cheap end plants?